Back in my junior year of college I was taking the final astronomy courses for my major, Stellar Evolution and High Energy Astrophysics. Stellar evolution (somewhat obviously) involved the evolution of stars; how they form, how they burn and release energy, how they die. To better illustrate this concept my professor found a program that modeled the evolution of stars from the beginning of their life. Here’s the website for the program used. Anyway I’ll tell you a little bit about stellar evolution now, then describe my project a little bit and give you a copy of the lab write-up after I completed it. I guess the best place to start is with stellar composition. Stars are made of dust, basically just hydrogen and helium molecules floating around in space in enormous dust clouds. There are occasionally higher order metals in the composition, but usually the value is fairly small. Once a big enough cloud forms, gravity will kick in and the dust will begin to collapse on itself, drawing in and compacting the dust for all eternity. The collapse does pause, momentarily, after it has compacted far enough to ignite fusion in the core. Basically, the gravitational pressure in the core of the star gets so strong the hydrogen molecules (of which the star is primarily made) are able to begin fusing together to form helium molecules. This process is normally completed through either the Proton-Proton (P-P) chain or the Carbon-Nitrogen-Oxygen (CNO) cycle. The P-P is a easier to ignite and results in smaller stars solely fusing through the P-P chain, while larger stars use a combination of both. Regardless of the process, however, the energy generated through the fusion process creates its own pressure that pushes outward, against the gravitational pressure. This results in a sort of duel between the two, leaving the star in a state of collapsing limbo while the star burns through its supply of hydrogen. This takes a long time. Stars are pretty big and it means they have an enormous supply of readily available hydrogen to fuse. The time spent burning hydrogen is called the ‘main sequence’ (look it up, super core part of astronomy) and it is where a star spends the vast majority of its life. Larger stars have shorter main life sequences, despite the larger supply of hydrogen because the vast size means it requires far more energy to prevent collapse than a smaller star. This results in burning far more fuel than a smaller star and, therefore, a much shorter life (when I say short I still mean millions of years). Regardless of size, all stars eventually run out of hydrogen. This means the star goes right back to where it started – continuing its collapse because there is no longer any outward pressure from fusion. Now this might be the point where you start shouting ‘Black Hole’ or ‘Super Nova’, but we aren’t quite there yet. First off, larger stars (which are the ones that create those super cool things) will usually begin burning helium. Obviously the hydrogen fusion resulted in a ton of energy, but it also left behind pretty much an entire star’s worth of helium. Helium fusion isn’t so different from hydrogen fusion, but it requires slightly more energy and is slightly less efficient, meaning it doesn’t activate until the star’s gravitational pressure increases beyond that of hydrogen fusion, once the star has used up its supply of hydrogen. This helium burning continues and the star does the exact same stuff as before, forever and ever until it becomes unstable enough that it collapses into a super nova or black hole. This is extremely general and not very detailed, so if you’re interested make sure to go read about this in much greater detail than what I’m providing. Now (jumping back to smaller stars), never actually reach the point where they can activate helium fusion. There is simply no way it has the gravitational pressure required and, for this reason, instead goes through the helium flash. Afterwards, it leaves behind a white dwarf, slowly burning for the rest of its life until death. 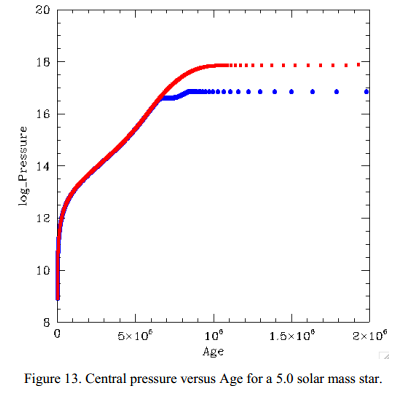 Anyway, this is the general lifespan of a star, more or less. 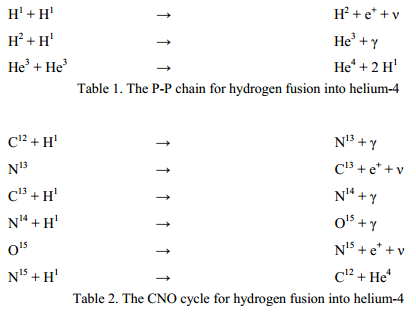 My project focused on the P-P chain and CNO cycle, which is why I focused a little more on that above. Basically, I wanted to see how the stars would change if the CNO cycle did not exist; if stars could not burn with the CNO cycle, what would they do? I’m sure you could probably grab at some theories or make a decent educated guess, but using this program I was able to pretty closely model what would likely happen if the star was not able to activate the CNO cycle. The basic conclusions came down to this: smaller stars are largely unaffected by the removal as they hardly used CNO burning in the first place. Larger stars went completely haywire because they relied on the more efficient process of the CNO cycle to maintain their size and life span, but the removal caused them to do a few different things. They collapsed further before activating fusion. This allowed it to increase the energy generation and counteract the gravitational pressure to a greater degree. It also, therefore, burned through its energy faster and, therefore, lived a shorter life on the main sequence. You can see on the figure below, pulled from my lab report, that the red star (no CNO burning) has a higher pressure because it needed to burn more energy to make up for no longer having the more efficient CNO burning. After that it would try to get back to helium fusion, but the collapses would occasionally go so far that helium fusion would be going on at the same time of hydrogen fusion and the entire star went out of whack. Sadly, this was all the time I had to run the simulator; I ran the bigger stars for about 10 hours and was only able to get to helium fusion. If I had gone longer, I never would have met my deadline or finished my project, but we were able to definitely gain a much greater understanding of how the removal of the CNO cycle would alter the star’s life. I hope you enjoyed learning a little bit about stellar evolution and, if you want, here is a copy of my original lab write-up for the course. Feel free to email me or leave a comment, and thanks for reading.